Dental implants are an advanced medical technology for the treatment of tooth loss. A titanium implant is implanted in the toothless area of the jawbone. The jawbone then fuses with the titanium surface providing a strong anchorage for the implant. The implant functions as a support for the dental prosthesis constructed over it. At One Stop Implants and Dental we use the latest in imaging technology such as CT scan for almost all of our cases. With this technology at hand the dentist can assess the jawbone in a 3Dimensional manner. With the use of conventional radiography alone the doctor cannot assess the thickness of the recipient site therefore the accuracy of placement decreases. Since every jawbone is different, treatment options for every patient is different. After careful assessment of the patient’s jawbone and surrounding teeth the patient will get all possible options. 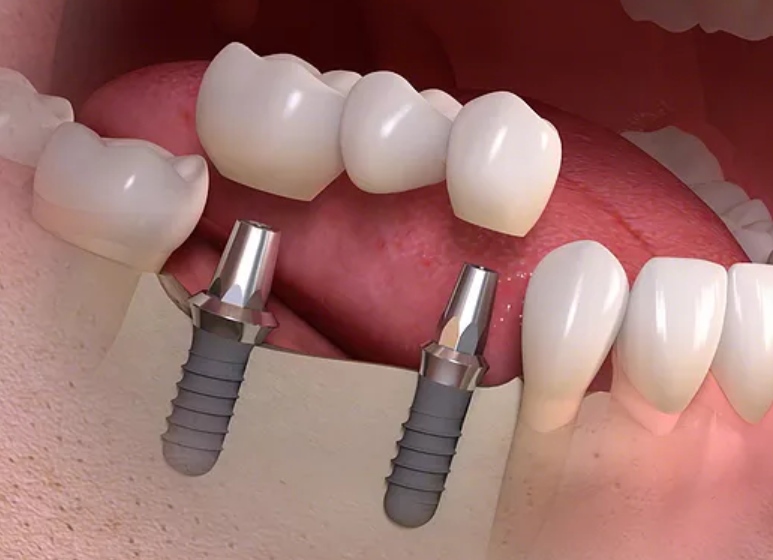 Usually the choices are between a fixed option where the missing teeth can be restored with a fixed appliance such as a crown or a bridge or a semi-fixed option such as a locator where the appliance attaches to the implant, but it is removed for cleaning purposes and finally a removable option where there is no implant used. Any type of tooth issue can lower your confidence. You may not feel comfortable while smiling, talking or eating. You may also want to avoid certain social situations because you feel self-conscious. Implants can be used to replace one tooth or multiple teeth. Implants are natural-looking and improve your smile. They can also restore your confidence. Most adults have 28 to 32 teeth. Every teeth plays an important role. Dental problems can result if there are one or more missing teeth. Teeth may not grow in properly. They may also be lost due to illness or injury. In rare cases, the teeth may not grow in at all. Implants are a great way to replace missing teeth without causing problems with the health teeth. If you have missing teeth due to injury or disease, then you will benefit from getting dental implants.You may also be a good candidate for dental implants if you find it difficult to wear removable dentures. Your health history will be evaluated before you get dental implants. Implants come in different shapes and sizes. They are designed to meet the needs of the patient. If you are already wearing a partial plate or dentures, then implants may be a good choice. The first step is the consultation. The benefits, risks and alternatives solutions will be discussed during a consultation. If you have any questions or concerns, then you will need to ask them during the procedure. The step-by-step procedure will also be explained during the consultation. Replacing a few teeth is usually simple process with a high success rate. A dental exam will be performed before your procedure. The extent of the exam is contingent upon your unique needs. A few x-rays will usually be taken during your first visit and asecond dental examination may also be required. In some cases, a CT scan is required if the patient has suffered extensive bone loss. Your dental history is another factor that determines whether you will be a good candidate for dental implants. Your dentist will also discuss what you want to accomplish by getting dental implants. The more the dentist knows about your chances of getting periodontal disease, tooth decay and bad habits, such as tooth grinding, the more appropriate the proposed treatment plan will be. If you have any medical conditions or are taking any medications, then you will need to let your dentist know that. The dentist may need to speak with your physician. After the aforementioned steps have been taken, your treatment plan will be customized. In some cases, the treatment plan can be started the next day. This may include bone grafting and extraction. X-rays are usually taken during the first exam unless you provide your own. In some cases, the implant can be placed the same day. Additionally, the impressions may be taken the same day, and the procedure may not be completed until four to six months. Regardless of whether you get the treatment the same day, there are several things involved in your treatment plan. This includes restoring the implant with a fixed appliance or crown. The bone cells will create more bone. This is a process that is known as osseo conduction. There are materials inside of the grafts that are used by bone cells to repopulate the site. Furthermore, there are other materials that are used as substrate, or food.